One of the most memorable moments in video games this year came during a particular scene in What Remains of Edith Finch. Without trying to spoil anything, it involves having to perform a menial piece of work with one hand while simultaneously controlling a character in a fantasy adventure with the other hand. 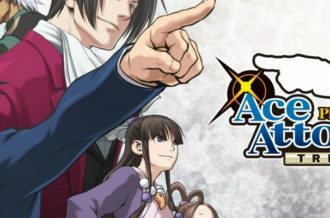 Now this was far from the only game to try and and put twists on mundane nine-to-five jobs, or even the first one to feature a mash-up between these jobs and something more fantastical. It just set a new standard for similar gameplay and contrasts like it from that point onward. 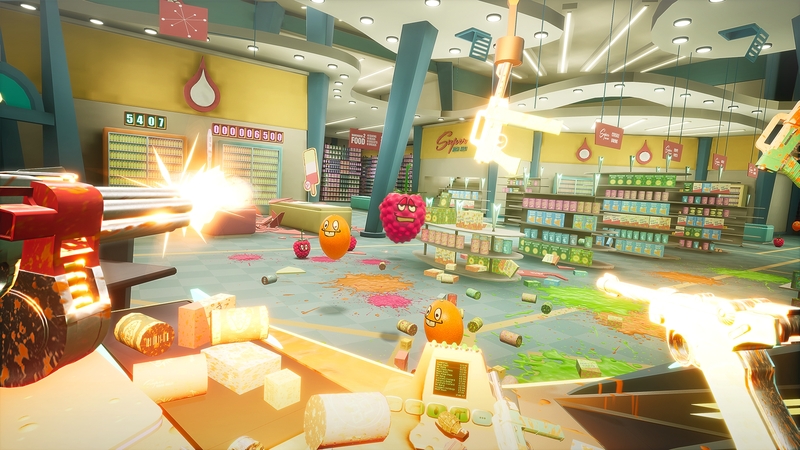 Now, Shooty Fruity is (unsurprisingly) not an adventure game with an emphasis on an emotional narrative like Edith Finch, instead being a first-person VR shooter, but its entire hook does revolve around having to perform a seemingly ordinary job while also engaging in arcade-style action. So will we be ending 2017 with another memorable — albeit more crazed- – moment in the same vein? Shooty Fruity has a particularly simple setup. You are the latest minimum-wage employee in a massive supermarket, dealing in homogenized food and consumer goods as well as enhanced, mutated fruit. With each level, you have to handle the various groceries as they come to you via an automated system of conveyor belts. But then the fruit revolts and starts charging towards you, forcing you to…well, the goal is right there in the title, minus the “y”s. Hold out for a long enough amount of time and you earn the ability to get promoted to new areas with new tasks, along with a nifty arsenal that you can purchase with the spilled blood of your enemies (also known as “juice”). 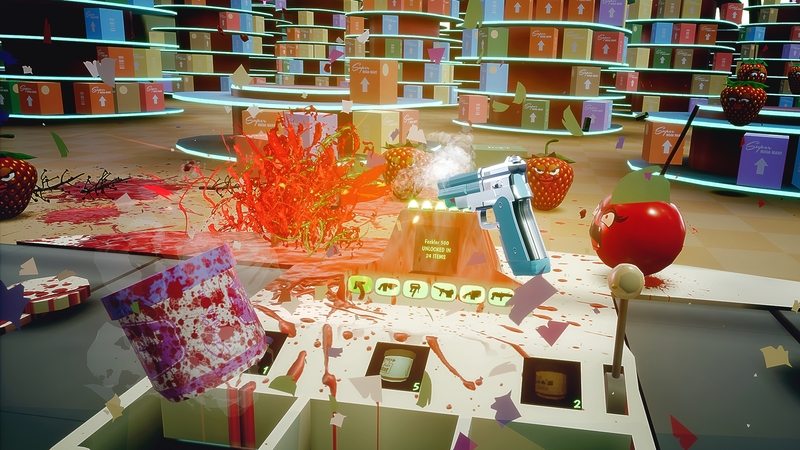 The different types of levels in Shooty Fruity each revolve around a different chore found in a market such as this, such as scanning items as they come in and sending them down a chute to a conveyor belt, placing food cubes onto trays in a canteen with the correct matching colors as they pass by, or bagging correct combinations of grocery items as they head by on both sides. And all while this happens, guns pass by overhead on hooks, which you grab as defenses against the killer fruit. Should each of them make it close enough to your workstation, they’ll attack it until it’s destroyed or you until blow them to a pulp. 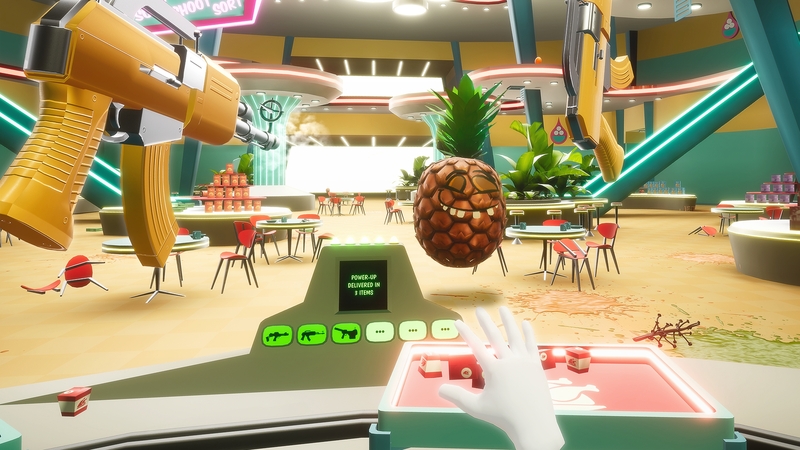 It sounds like a simple mashup of other VR games such as Job Simulator and Raw Data at first, but things get trickier soon after you begin and in the good way. As alluded to earlier, you use juice earned at the end of each level to purchase more guns from the store’s vending machine. Before each round, you have the opportunity to craft your own loadout when it comes to weapons, allowing you to decide which guns pass by overhead and in what order. And of course, each one has their own strengths and weaknesses. 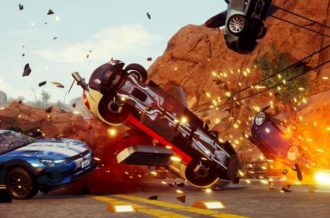 Shotguns are powerful but only best at close-to-medium range, rapid-fire guns make for a good spread of bullets but can be erratic, and revolvers are incredibly powerful but break quickly, forcing you to drop it and scramble for the next weapon to grab. It’s clever little idea that adds a touch of strategy. But there’s let another twist to your loadout as well. See, it may sound at first like the whole point of the actual grocery-related tasks is that if you don’t succeed in performing them, you get fired and it’s game over. It’s a natural assumption to make, right? Well, sorry, but you aren’t bagging canned goods to earn a paycheck here, you’re doing it to survive. Your selection of weapons is tied directly into your current chore, you see. Scan enough items and you unlock the next gun in the loadout which will join the others on the overhead conveyor (along with the occasional power-up you can pick up and drop into a slot to activate). So while you’re trying to fend off an assault of crazed apples, you still need to work at the task at hand, lest you be underpowered against later hordes. 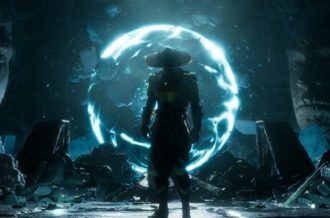 It’s a perfect way of merging the two gameplay mechanics and again means you have to consider your weapon choices and their order more carefully. Then, of course, come the titular stars of Shooty Fruity. Each level focuses on a particular combination of the putrid produce, which has a nice amount of variety to it. You’ll be facing off against speedy limes, strawberries that shoot seeds at you when close, massive pomegranates which lob molasses at you and take a lot of damage, airborne exploding cherries that you can still throw back when they drop down and more. Planning which weapon works best against each one is key and careful attention must be paid to surroundings since the fruit can pop out of every vent and corner. 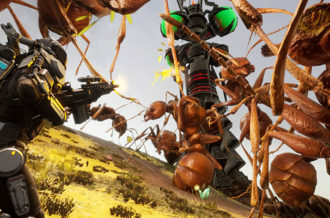 The enemy AI nicely takes advantage of the wide VR arena, distracting and flanking you from around the whole area, sometimes only seen out of the corner of your eye, using the various shelves and scenery as cover. It isn’t anything too complex (as it’s all a light gun shooter at its core), but it still means the enemies provide a good challenge. Control-wise, Shooty Fruity keeps things nice and simple, having you use motion controls to move your disembodied hand about with items you can pick up being highlighted when near them. While guns require an extra button press to drop them, unlike grocery items where you can just take you finger off the trigger being held down, it only takes second to easily get the hang of things, immediately being able to switch to point-and-shoot combat in a snap. Each gun handles nicely, providing a satisfying weight and impact with each successful pulpy shot…well, except for the throwing grenades. Look, we know VR is all about immersion, but we’re willing to make an exception for grenades, since actually having to pull the trigger on each one and physically throw them is a rather drastic change of pace (and trying to judge how much strength to put behind them is annoying). 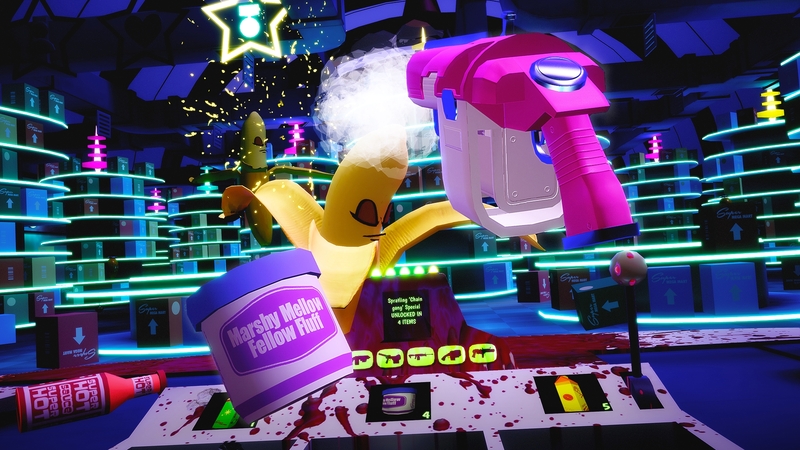 In terms of presentation, Shooty Fruity perfectly captures the cheesy feel of working in a classic supermarket setting, from the tacky pastel/neon colors and graphics adoring each room to the different muzak tunes played over the loudspeakers. The cartoonish faces and expressions on your citrus-packed foes are also a delight, nicely contrasting with their 3D bodies and evoking the kinds of mascots you’d find while shopping in each aisle. This is naturally part of the game’s cute sense of humor, including a lemony fellow employee commenting on your gunplay and the kinds of awkward memos from the manager that pop up when heading back to the break room. The only complaint is that each type of level has only one layout, limiting the variety in both visuals and gameplay. White there is occasional night level, even a bit more in this area would have been appreciated. Shooty Fruity does have one other particularly annoying flaw, through, and it’s one less common in VR games and much too common in mobile games: a star-based progression system. Hey, remember when actually completing a particularly hard level in a game was enough of a reward itself and simply just let you advance to the next level? Well, chuck that apparently archaic thinking out the window. 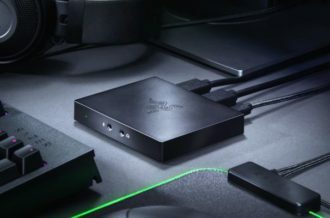 At the beginning of each level, you’re given three challenges to perform, ranging from simple tasks like scanning a certain amount of groceries to specific ones like killing two bananas with SMGs. But while most of these early on are just unlocked through regular gameplay, later ones mean that you can splatter juice everywhere like a champ and yet still miss out on some stars required to unlock the next level (and a couple of levels seemingly having a bug that prevented scanned items from registering and thus locking out stars didn’t help either). 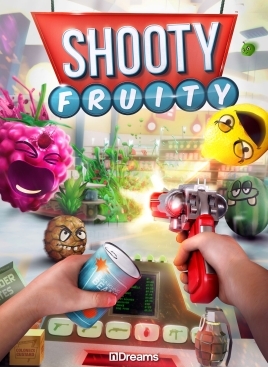 Providing terrific arcade action, Shooty Fruity expertly blends together classic shooting galleries with much-appreciated bits of strategy, all thanks to its unique premise that has you trying to manage two different games at once. The difficulty level is always nice and fair, allowing for several different play styles and weapon combos to try, and the simple, cute enemies still put up a proper fight. Even at its most basic, it’s still a colorful blast of classic arcade fun that’s worth checking out. Odds are you won’t forget the time you blew up a sentient watermelon while successfully ringing up a purchase for a cactus anytime soon.